If you keep up with your twice a year dental appointments, you likely know how important a dental hygienist is to your biannual dentistry visits. However, you may not be taking full advantage of all your hygienist has to offer. Dental hygienists are skilled professionals who are invaluable resources for helping patients with their preventive dentistry needs and oral hygiene goals. 1 – How Can I Minimize Bad Breath? If you’re suffering with chronic bad breath, your hygienist can help. 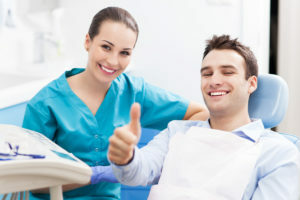 They’ll evaluate your current oral hygiene routine, diet, medications, and chronic or systemic medical conditions. All of these things and more may be influencing your breath. A hygienist can help you pin point the cause of your bad breath, and most importantly, they can assist you in addressing the causes of your bad breath. 2 – What Impact Does Smoking or Tobacco Use Have on Teeth? It should be old news these days, but smoking and using tobacco is not good for your whole body health. It is also bad for your teeth. Tobacco use can severely discolor tooth enamel, cause dry mouth that increases risk for tooth decay, and increase chances of oral cancer diagnosis. Your hygienist can tell you more about just how bad smoking is for your smile. 3 – Do Adults Need Fluoride Therapy or Dental Sealants? Many adult patients think that fluoride treatments and dental sealants are just for kids. Actually, patients of any age can benefit from these preventive services, especially if they experience frequent tooth decay or severe enamel erosion. Hygienists can perform these simple preventive services as part of any dental checkup. 4 – What Oral Hygiene Products do You Recommend? When it comes to keeping smiles healthy, it’s essential to have the right tools. If you’ve visited the oral hygiene aisle of your local pharmacy or grocery store lately, you were likely overwhelmed by the sheer number of options available. Toothpastes, tooth gels, and even tooth powders. Floss, waxed floss, super floss, water flossers. It can be hard to find the right products, but your hygienist can help you find the best oral hygiene products for your specific oral health care needs and goals. At the Sunnyvale dental practice of George T. Philip, DMD, we have two skilled dental hygienists, Mary and Alejandra who goes by Alex. Both Mary and Alex have years of advanced training and experience that allows them to partner with patients to achieve and maintain the optima level of oral health. We can’t wait to show you the best techniques for brushing and flossing your teeth. If you have questions or need to schedule an appointment, call our caring Sunnyvale dentistry team today. We offer a wide range of preventive, restorative, and cosmetic dentistry services and welcome patients of all ages.